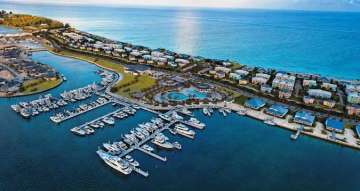 About Bimini, The Bahamas - Mosko Realty Ltd. The nearest island to USA, located only 50 miles to Florida is one of the smallest islands in the Bahamas, Bimini. Known as Ernest Hemingway’s favorite escape and summer home, Bimini is also a very historical island. Bimini consists of two main islands—North Bimini Island and South Bimini Island—and numerous cays. North Bimini is only 7 miles long and 700 feet wide and is the busiest of the two bimini islands. Alice town is the main settlement in North Bimini. South Bimini has the airstrip and is much quieter to North Bimini. South Bimini is restricted to boating tourists since its mainly private residences. Most of Bimini’s beaches are found in North Bimini on the west side. The most popular are 3 contiguous beaches, Radio Beach, Blister Beach, Spook Hill, all found in Alice Town. In South Bimini, a very popular beach, Tiki Hut Beach, has 2-miles of white sand along the west shore. If you are looking for the top rates beaches, you will need a boat to visit the cays of Bimini like Turtle Rocks, Piquet Rocks, Holm Cay, North Cat Cay, South Cat Cay and Ocean Cay – at these places you will find secluded beaches. Piquet Rock has a large wreck of a Spanish ship and a most see is the fabled Lost City of Atlantis just off the shores of Bimini. The history of Bimini is very unique and interesting and played a big role during the Prohibition times in United States. Due to its close proximity to the USA, it served as a convenient offshore speakeasy and liquor store during prohibition days. Rumrunners used to store their stash on the nearby shores. Many notable residents visited Bimini from the early days and still today. Jimmy Buffett spent time here while writing his book, and Martin Luther King, Jr. even composed parts of his Nobel Peace Prize acceptance speech while sailing with local boat builder, Ansil, who still lives on the islands today. Howard Huges, Richard Nixon and Adam Clayton Powell Jr. were just a few other notable persons who were lured to Bimini. Bimini is well known for its big-game fishing spots, since it is so close to Miami, many anglers go to the islands by boat to fish and to enjoy the island night life. Scuba diving and snorkeling are also popular with the many shipwrecks in the are like the SS Sapona which ran aground in 1926 during a hurricane. SS Sapona was built by Henry Ford during the First World War. Bimini also has a “healing pond” like its name implies it supposedly has healing properties for those who swim in it. Accessible by boat only, it is a natural fresh-water spring that pumps up lithium and sulfur inside a salt water swamp in the mangroves of Bonefish Creek.